Hello hello! Leila here, I'm going to be talking about the third chakra today, the solar plexus chakra. Over the last few blogs, I've been walking you through what the chakras are, how they replace to your energy and wellbeing and how Reiki can really support your in clearing and balancing your chakras. Teaching about the chakras is part of my upcoming Reiki Level I & II Course and as a Reiki Master and Teacher, I don't think there has been a day since I've been attuned to Reiki that I haven't used Reiki or worked with my chakras in some way. It has totally become a way of life for me and I hope it can for you too! What and where is the solar plexus chakra? The solar plexus chakra is the third of the seven chakras within the body. It is located just below your ribcage, between your naval and diaphragm. In my personal experience and that of my clients', the solar plexus is the powerhouse of the energy centres, it holds our personal power, our sense of self, who we are and how we perceive and are received by the world around us. 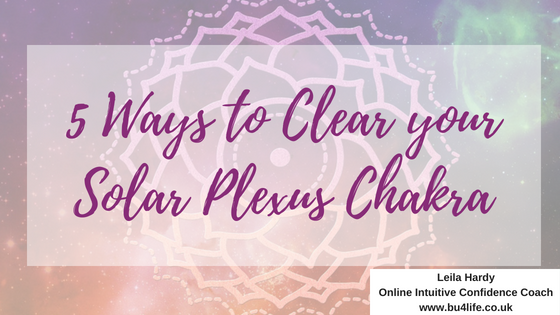 Because of this incredible power of the solar plexus, it can often become blocked because of the sheer overwhelm of life that happens sometimes. The solar plexus chakra is powerfully connected to the energy vibrations of empowerment, self-belief, relaxation, ambition and authenticity, when energy flows through a clear and balanced solar plexus chakra. You'll have healthy boundaries and a clear sense of who you are and being totally okay with that. When imbalanced or blocked, the vibration may be one of feeling like a victim, lacking in confidence, worrying what others think of you, a sense of powerlessness. You may experience overeating, overindulgence in compensation for the imbalance, digestive issues (think of the location of the chakra!) a need to control or manipulate others. When you recognise the location of the solar plexus chakra and think about all the physical organs that are also located in that area, liver, gal bladder, stomach, intestines, kidneys, spleen, pancreas, you can see why the solar plexus can have huge impacts or benefits on your physical health! Flowers: The solar plexus chakra is commonly associated with the colour yellow (you know me though, I encourage you to see what colour feels right and true for you!) Yellow flowers like dandelions, daffodils, tulips can all help you clear and balance your solar plexus chakra-just look at some and notice the sense and feeling of wellbeing, lightness and brightness you experience in your body and energy! Appearance: Take care to pamper yourself and feel that you are looking your best. Take time to style your hair, wear a favourite perfume, take a shower and nature and take care of yourself in this way to clear your solar plexus chakra. Essential Oils: The solar plexus chakra responds incredible effectively to uplifting, energising essential oils, like citruses - orange oil, lemon, grapefruit. You can diffuse them, or dilute them and apply to your skin, even around the solar plexus area. There are other essential oils that also support your solar plexus (think digestion again!) like ginger, black pepper, cinnamon, chamomile, and fennel. Reiki: Using Reiki in a meditation, be still and allow yourself to invite fear or anxiety to join you so you can make peace with it and offer unconditional love and forgiveness as those fears or anxieties arise. Each time they do, breathe in, and exhale deeply, releasing those sensations as you acknowledge them. This is a powerful way to integrate all the parts of you (even the ones you are not so proud of) so you can access your inner power. Sunshine: Spend time outdoors in sunshine and nature. Whether it is reading, meditating, pilates, or simply sunbathing, sunken can rally help to clear, heal and balance your solar plexus chakra. I am powerful being myself! Next time, I'll be focusing on chakra number 4, the heart chakra - the bridge between the physical and spiritual realms! Do you feel like you need some support in this solar plexus area? Learning Reiki for yourself can support you as you clear and heal all your chakras. Learn more and book your place on my Reiki Level I & II course now!